Chocolate Friday is here again! Seems like it came quickly this week. Whether your week went quickly or slowly, you really should have some chocolate today! My friend Jill sent me a link to a recipe that I had to try! I made it for a church potluck. 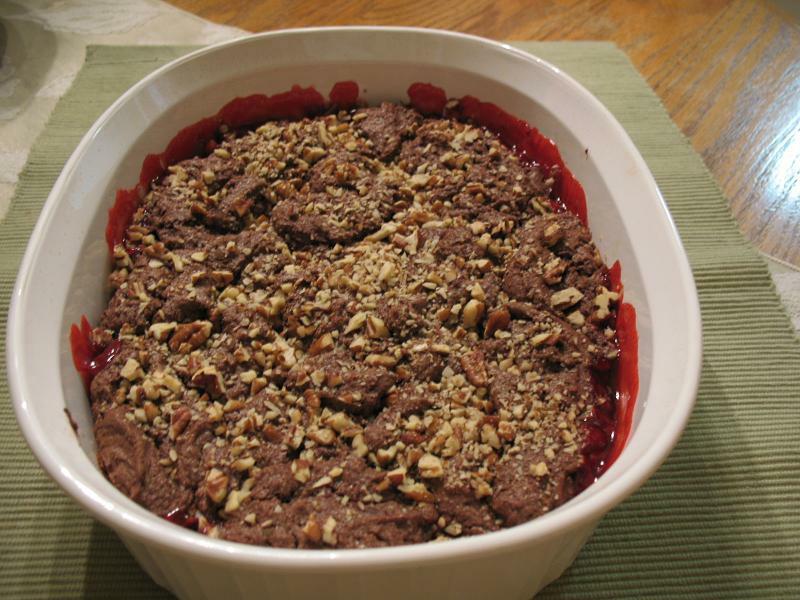 It's a copycat version of Cracker Barrel's Cherry Chocolate Cobbler. Yum! Just click the link for the recipe. It's best served warm and really good with a nice big glob of whipped cream on top! Or you could try some ice cream with it. I really liked it, but I would like to try it with dark cherries next - I think that might be even yummier. Well I shared my chocolate, so don't you think you should share your chocolate?? You know the drill - link up your chocolate posts below with MckLinky! I'm sure you've got a chocolate post hiding somewhere. You don't even have to write a new one - dig one out of the archives to link up! See how easy-going I am? And if you don't have a blog, share your chocolate thoughts or recipes in the comments! And I have a question you can answer in the comments today! I'm really curious - have you ever made any of the recipes from my blog? If so, which one(s) did you try? I would love to know! Have a fabulous chocolatey Friday! Chocolate and Cherries - yummy! I'll have to try that! That cherry chocolate cobbler is now on my list :) Likely won't make it until after the holidays... but that will be the first recipe I try from you! My hubby will love it. I admit I'm not a big cherry fan. But you make it look so good! LOL. Big so much chocolate so little time size hugs to you my friend. Huh...chocolate in a cobbler? What will they think of next? There are few combinations on earth that are better than cherry and chocolate. I linked up my very first cookbook review that includes a recipe for Pecan Pie Bars (to which chocolate could be added) and pictures of some chocolate toffee cookies. I hope y'all enjoy it. This is so funny! 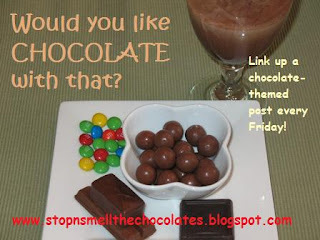 I just posted a link to you on my blog and you're blogging about chocolate, lol! ooops, no I didn't. Ignore that, lol! I meant that I just wrote a post (in which I'm linking to you) but that post won't be published for a few days. Sorry, lol! I'll let you know when it is published. I just published a "quiz" and got myself all confused. It is certainly interesting for me to read the article. Thank you for it. I like such themes and everything connected to this matter. I would like to read a bit more soon. funny that I left that comment earlier... because we ended up making this dessert over the weekend and it was a big hit!